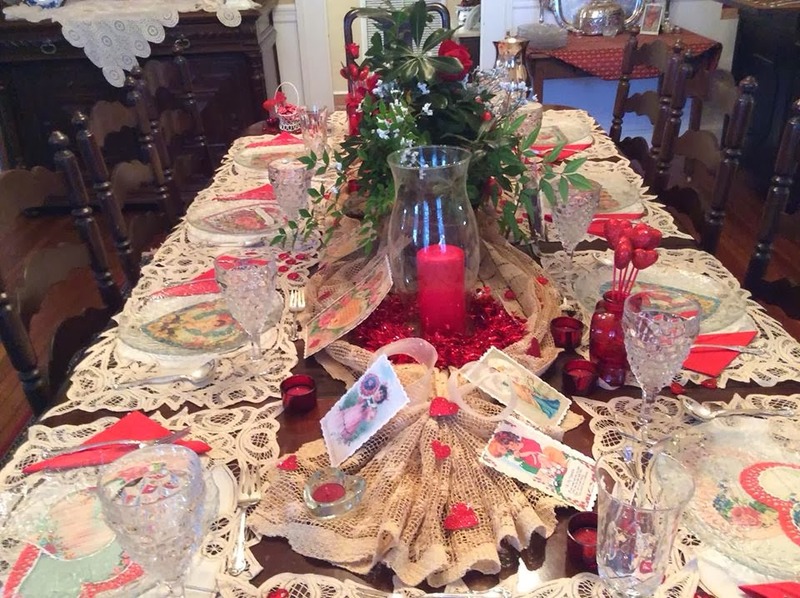 You may remember Seven Gables Christmas tour at my friend, Maxine's country home so I know you will enjoy her home decorated for Valentine's Day. Maxine invited our Sunday School class for soup and salad last week. 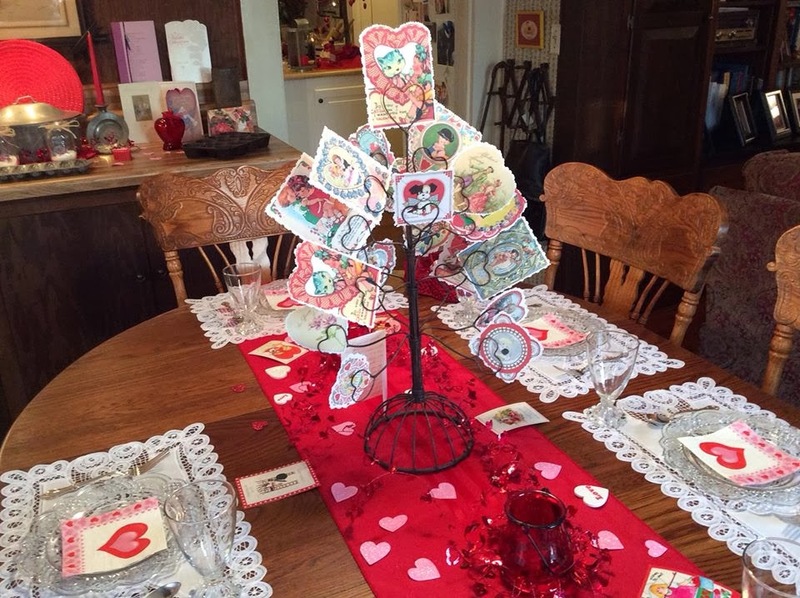 We enjoyed a special treat viewing her delightful vintage valentine decor all over her home. Tables were set up in various rooms. The first four pics are from Maxine's facebook page since I forgot my camera. 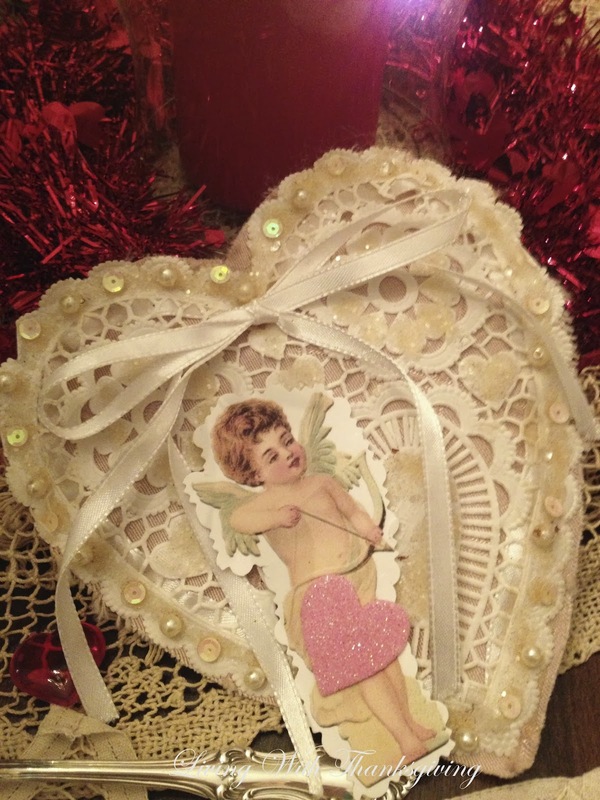 This is a darling vintage valentine her mother made many years ago. Maxine loves to use her mother's heirloom items. Sorry for the blurred pic made with my cell phone. 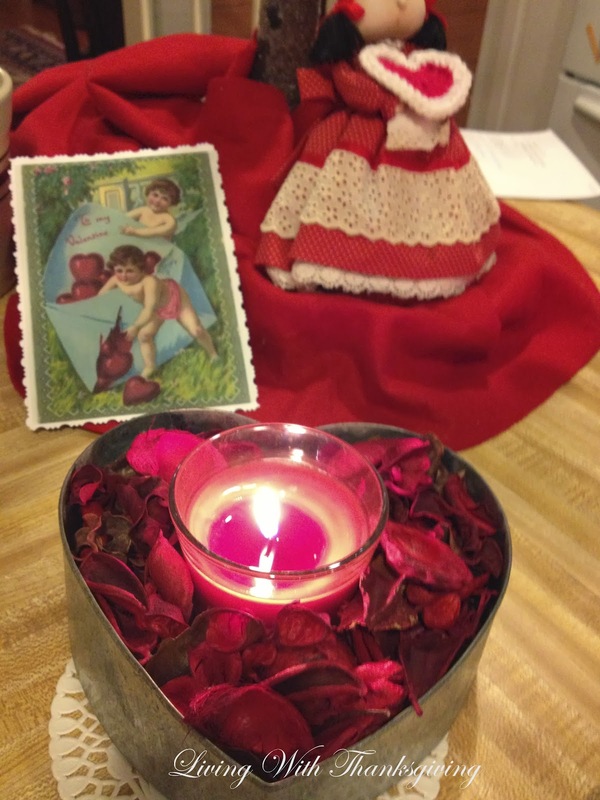 Another handmade valentine her mother made years ago. She lived to be 92 and was active in her garden club, church and other activities very close to the time of her passing. 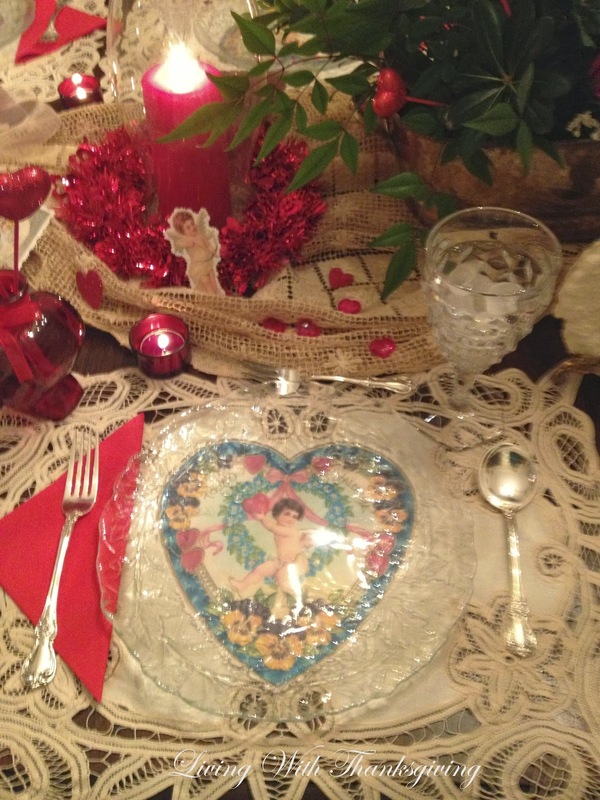 Under each clear dinner plate were reproduction vintage valentines. 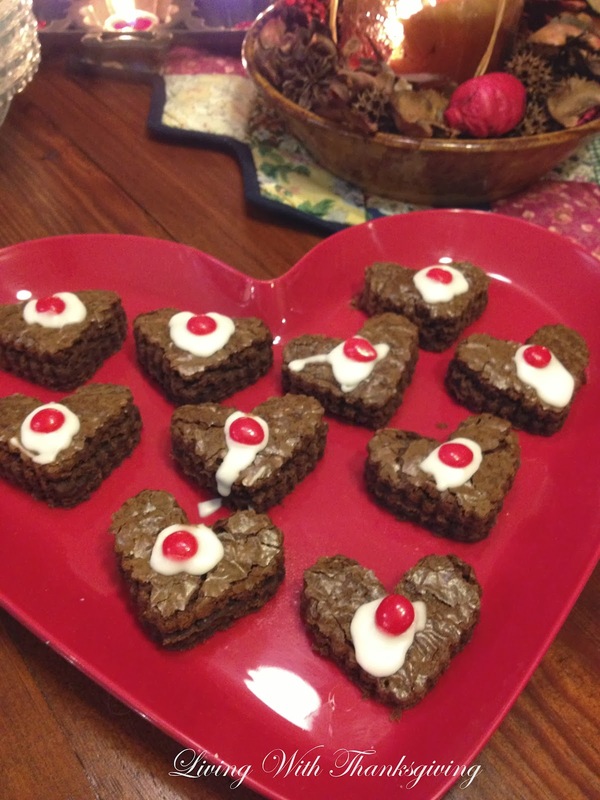 I thought the sweet brownie hearts were pretty. We were given valentine snack bags to take goodies home. Her kitchen bar was full of beautiful desserts. Maxine is very sentimental so I bet these graters are from family members. Cookie cutters too. This tree was a great find from the Dollar Tree for $4.00. She has great plans to use it for all the holidays. 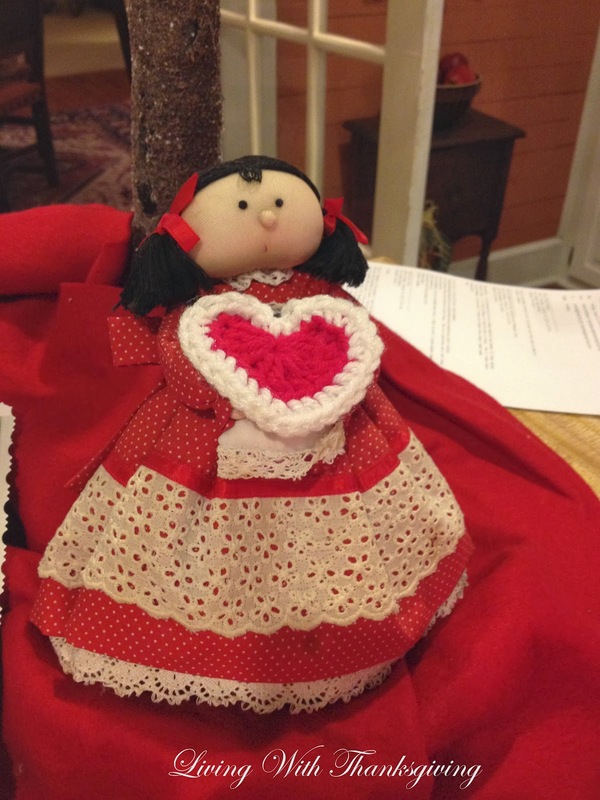 I thought it was neat how she used one of her daughter's dolls to decorate for Valentines. 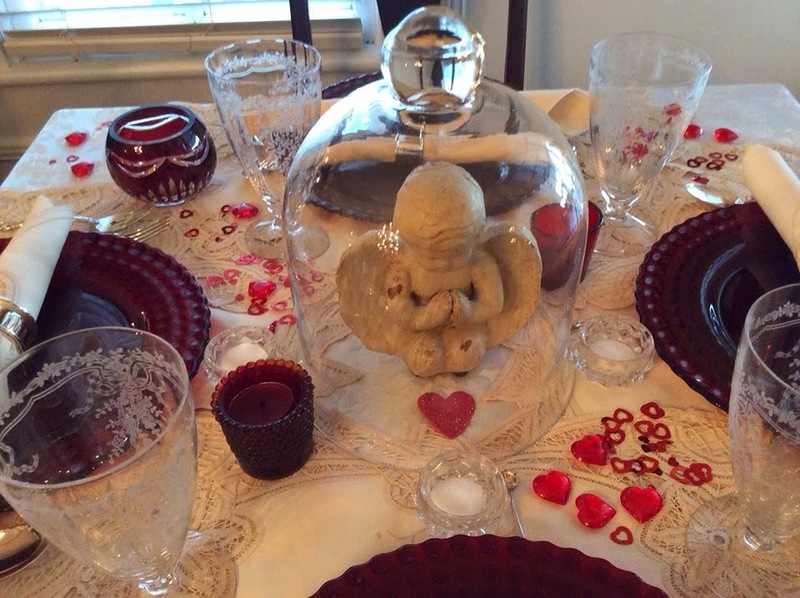 Everyone was impressed with so many delightful vignettes. I kicked myself for forgetting my camera because I am sure I would have made more pictures and showed you the food we enjoyed. On a cold night it was a treat to taste numerous kinds of soup such as cabbage, taco, chicken noodle, broccoli chicken, and vegetable soup along with many delicious salads. Maxine is a delightful hostess and generously shares her gracious hospitality at Seven Gables. Linking to Seasonal Sundays, Met Monday, Amaze Me Monday, Inspire Me Tuesday and Wow Us Wednesday. Oh wow, your friend went all the way like for the C'mas holiday season!!! Love the tablescape for soup and salad and that tree is adorable! Wow, this is beautiful, Bonnie! 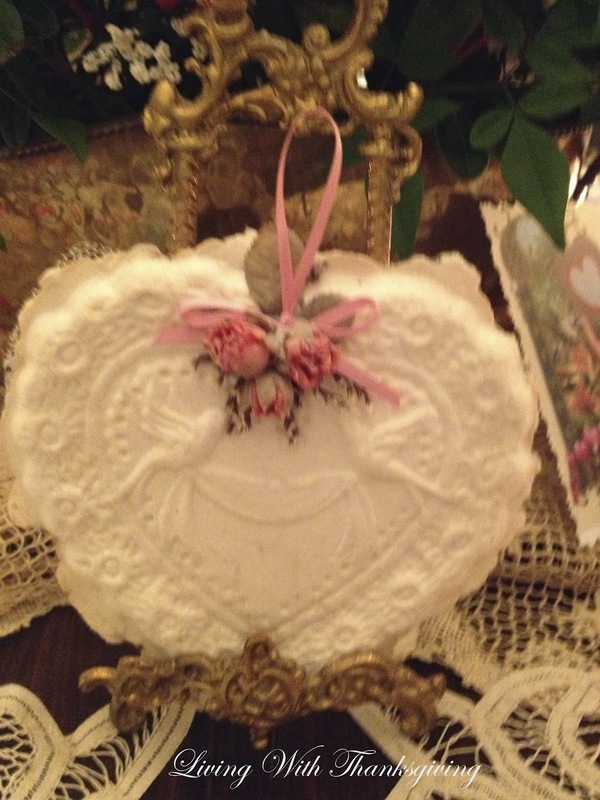 There are so many great decorating ideas here, and your friend has some wonderful vintage items, doesn't she? It sounds like you had a delicious lunch, too! It's such a treat to dine at someone's home when they've decorated in such a fun, cheerful way. 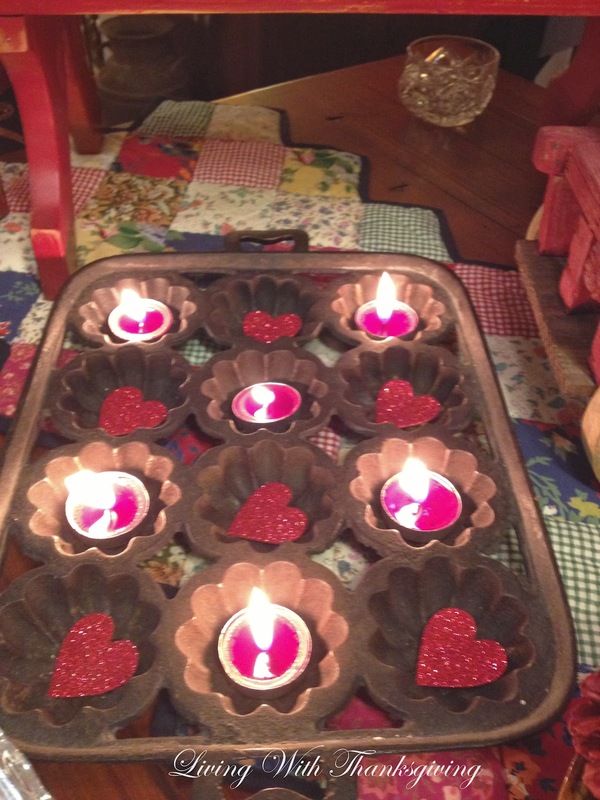 Thanks for sharing the pictures with us, Bonnie. I hope you have a great week! 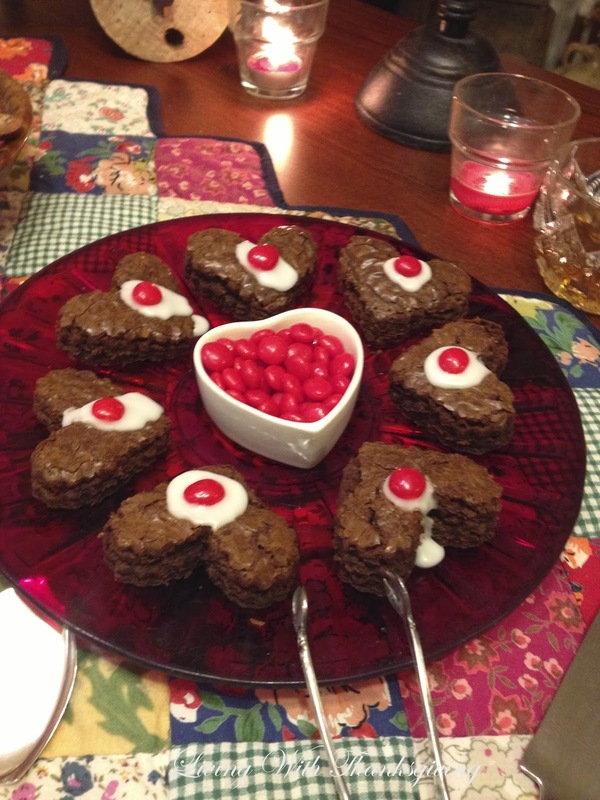 Thanks so much for sharing your friends Valentine decor! 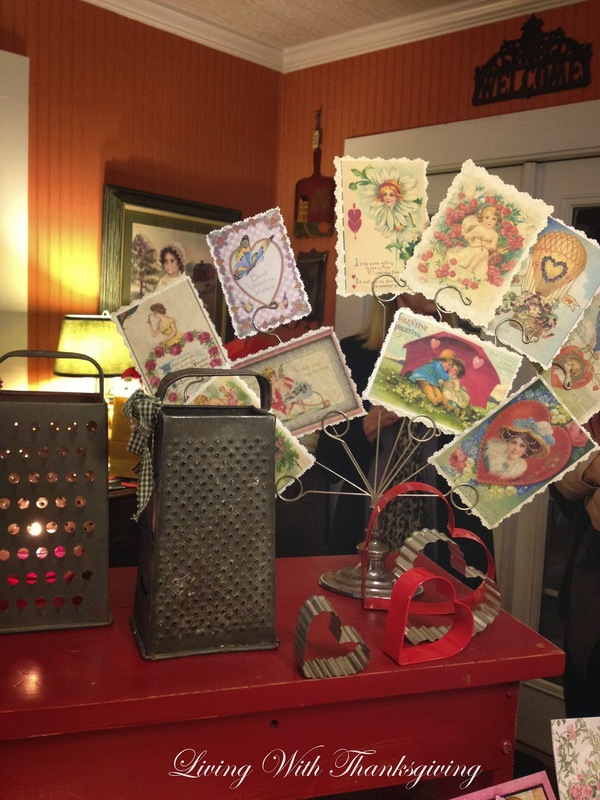 She has quite the fabulous collection of vintage valentines!! I love seeing the vintage Valentines, they warm my heart!! Wonderful tables...they are all just great! 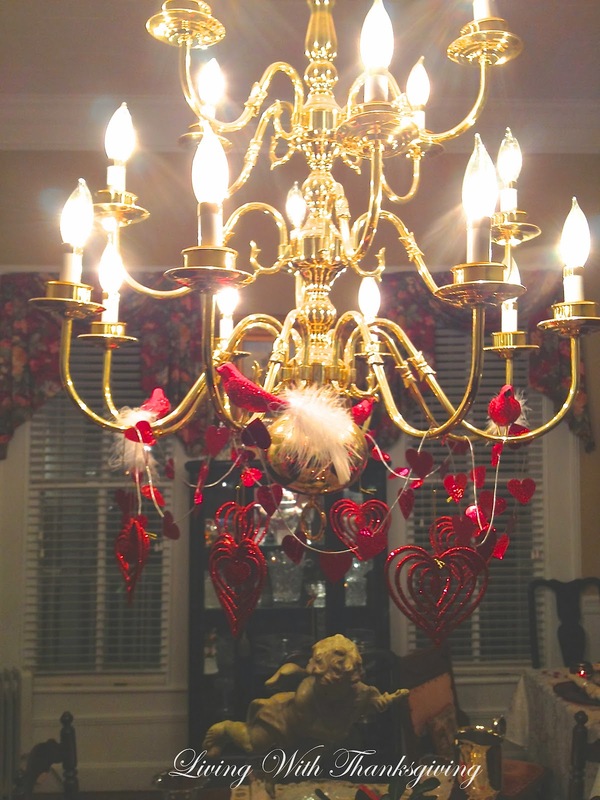 I love the chandelier. 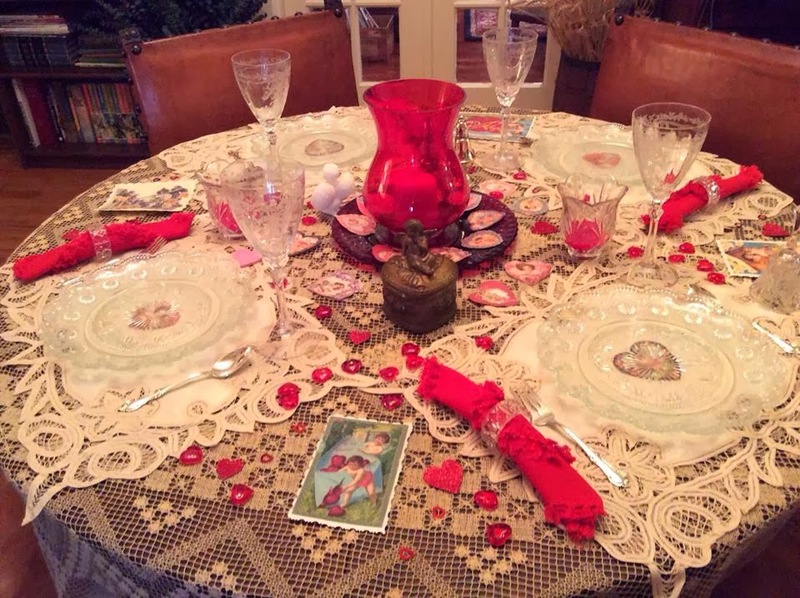 Wow Bonnie, she really went all out for the special luncheon~all the tables are so sweet and dressed to the nines! What a wonderful time you must have had, thanks for sharing! Maxine really knows how to do it up! What a lovely way to welcome ladies into her home!!! Don't you just love it when someone does all the little things that make guests feel special? Kudos to Maxine. Oh oh I love the sparkling heart tree lights! Gorgeous! I love all that your friend has created. So festive and pretty. 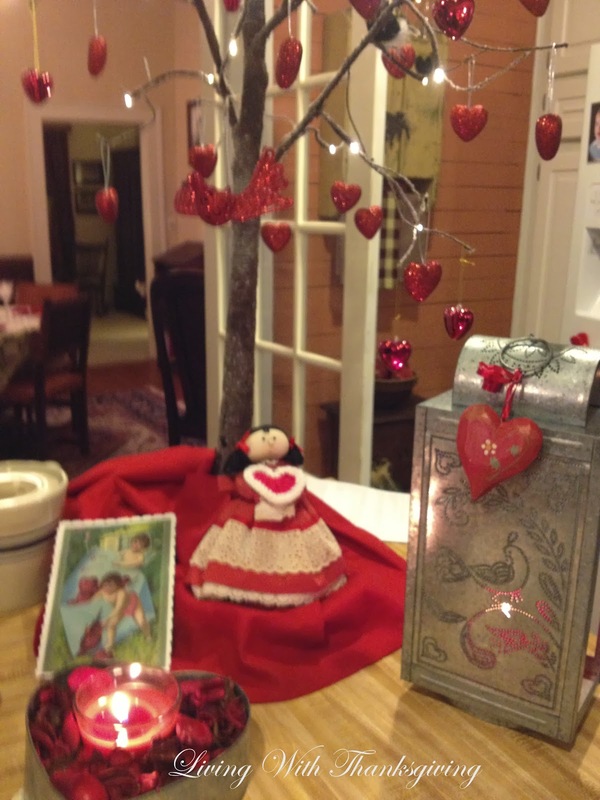 The little Valentine tree is darling. Thank you so much for popping in to see me and your kind words.